We have units available for long or short term self-storage. Sizes range from small 2.3x2.6x3.6 vaults great for data storage, up to 7.5x8.0x3.2 units that can accommodate cars and boats. In addition to the above services you also receive friendly storage advice from our onsite manager. We have top quality padlocks for sale. We also provide a mini furniture moving truck for use around our facilities. 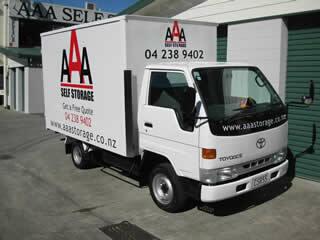 Call Cliff on 04 238 9402 and get a free, friendly, and accurate calculation on your storage requirements. Copyright © 2000-2016 AAA Self Storage Ltd. All Rights Reserved.